One of the venues for whom I review will be offering a major prize for authors. Here is the announcement. 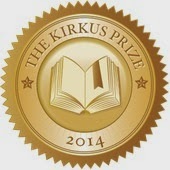 The Kirkus Prize is one of the richest literary awards in the world, with a prize of $50,000 bestowed annually to authors of fiction, nonfiction and young readers’ literature. It was created to celebrate the 81 years of discerning, thoughtful criticism Kirkus Reviews has contributed to both the publishing industry and readers at large. Books that earned the Kirkus Star with publication dates between October 1, 2013, and September 30, 2014, are automatically nominated for the 2014 Kirkus Prize, and the winners will be selected on October 23, 2014, by an esteemed panel composed of nationally respected writers and highly regarded booksellers, librarians and Kirkus critics.